Silent Sid Weight Belts have been built up and tested with the help and experience of Carl Britt and his Gym, The Class House which is right on our doorstep here in Carmarthen Road Business Park. Having the gym just 10yrds from our workshop has given us the unique ability to build belts, make changes and test out the functionality literally immediatley, our ability to get that instant feedback is something no other Weight Belt manufacturer has. To find out more about Britt Personal Training visit their site brittpt.co.uk. Below is an overview of just what goes into the making of our Weight Lifting Belts. We do document a few random belt builds with a photo diary and over time these will be added to the site showing some of the uniquely special belts that we get requested to do. Our Weight Belt prices start from £80.00. We don't do 'Standard' but for that price you get to choose from a selection of 4 Inner Suede colours (all of which are a plush 2.5mm (6oz) thick) and 8 or so Leather dye colours and a few stitch colours. All Belts are hand cut and hand dyed so no two will ever really be the same. We also use various airbrush techniques to get some VERY special finishes. It takes us between 2-4weeks to complete your order depending on the length of our waiting list, Christmas tends to be our busiest period so please leave plenty of time to ensure we can get your order completed, if in doubt get in contact with us. We use Fiebings Proffessional Oil Dye to get the best, deepest colour to our leather. This can then be distressed to give an aged look or airbrushed to get a true custom look. We let the dye set for between 12-24hrs before adding a protective finish (like Fiebings Resolene or Tan Kote) which gives varying degrees of shine and ensures the belt stays looking good for longer. A good, solid, and consistant colour looks very strong but for some effects like our popular western 'gun slinger' design then the only way is airbrushing. We do actually airbrush even if it's a solid colour (as a last coat) this ensures a streak free proffessional finish. Black outer, Red suede lining with a White stitch...No problem, distressed Walnut outer with Purple suede inner and Burnt Orange stitch - we can do that too. The choice is all yours. All of our Weight Belts are hand cut from 4-6mm Veg Tanned leather hides with 2.5mm Chaps suede inner lining. Nearly all of our belts are made to order and therefore you choose which of our dye colours, lining colours and even stitch designs you'd like use to put together for you. Special requests like double stitching, etc can also be catered for at this stage. 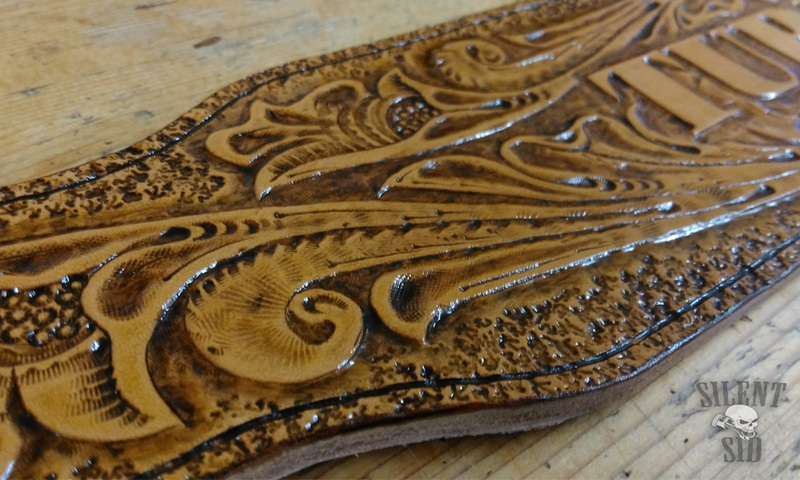 We can even do a Sheridan style carved belt - see here for an example. Any questions? get in touch. We make the belts from scratch so adding things like names, patterns and pictures to your belt isn't a problem at all. For some designs we'll use our laser machine, For others we can emboss. Whether it's something personal or a brand logo from your gym network or club, Custom Branding is a unique way of getting your words and logo's out their where they count - in the gym, on the competition ground, infront of others that simply have 'belts' - you have a statement. Prices vary depending on what you need, don't panic, it's never going to be a deal breaker amount of cash but it is worth every penny. Make sure you're wearing a tee shirt or whatever you'd normally train in. Tighten the belt around your stomach, the same height as your naval works for most people. 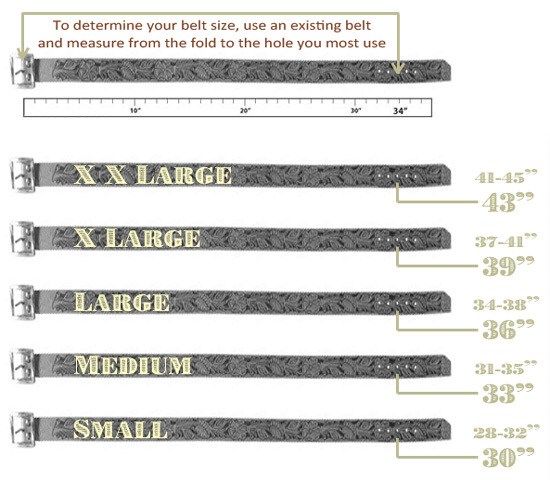 Make sure the hole you choose to use gets the support tightness that you're looking for in your weight belt. Make a note of the hole you've chosen. Take the belt off and measure from where the buckle attaches to the belt to the hole you'd chosen.